ONE OF THE BIGGEST changes in blogging during the past 10 years is the emergence of ways to use multimedia technologies when extending thoughts to different communities. I give a lot of credit to Audioboo for adding a new dimension to blogging. 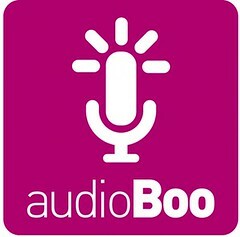 Audio blogging on Audioboo is simpler than taking a phone call because you don't need to talk to anyone while you're recording a Boo. However, some of the best Audioboos in my news flow are conversational. I listen to a core group of people in the Audioboo community because they either record conversations or they create Audioboos in response to on-going threads. After six months of consistently listening to other people, I've started making and sharing three minute audio clips every other day. A lot of the time, I write information in the ID3 tags of those Audioboos and sometimes include hashtags along with related hyperlinks. It's rather easy to copy the descriptions I create for those Audioboos and paste them into the "compose" portion of my blogging software. And I've started doing that already, wondering if my practice of doing that means I am part of an evolutionary movement in blogging. Posted from my iPad via the Typepad app and saved as part of my audio links.